Follow Belle in this enchanting tale in Disney Princess Beauty and the Beast. In a tiny village in France, a beautiful girl named Belle dreams of having adventures like the ones she reads about in books. When Belle's father goes missing, she is led to a mysterious castle where an angry beast takes her as his prisoner. Will this story have a happy ending? 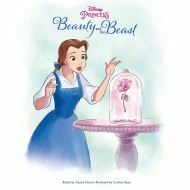 Find out in this Disney Beauty and the Beast picture book, retold by Amelia Hansen and beautifully illustrated by Angel Rodriguez.